Are the little brown spots just pigmentation or are they scars and if so are the scars raised? Or are they kind of (raised) skin moles? Are any of your spots raised? They are interchangeable, but the copper peptide serum will last longer because it contains more product. I have been involved in dermarolling for many years but I must admit that even after a solid half dozen years in this field there are still questions concerning problems that are so specific and so unique that nobody knows for sure whether mcironeedling would help. The lump may actually be in deeper layers than the skin (the skin is approximately 1.3 -2 mm thick, depending where it resides) and if it is deeper, mcironeedling will not help. Try a 2 mm dermastamp and stamp the scar every 3-4 weeks. You do not have to insert the full length of the needles (or not until you get accustomed to stamping). Please let us know about your results. Dermarolling / Microneedling / Re: Just received my products yesterday - so far so good! You can try applying hydroquinone on your pigmentation right after stamping with a 0.5 mm dermastamp. It will greatly enhance its penetration. Do not apply hydroquinone together with copper peptides or anything else though. To be honest, I really do not know whether microneedling would help in this case - I actually doubt it. But there is no other way of finding out but giving it a try. Buy a 1 mm dermastamp and stamp just a small part of the scar (as a test) every ten days to see how it reacts. You have to be patient because it will take many months to see results (if at all). Microneedling does not remove scars but it reduces/smoothes them. Whether this would make the tissue stronger than the current tissue is really difficult to say. After a revision, do not stamp sooner than 6-8 weeks later. You may need a numbing cream because this area is very sensitive. BTW everyone´s skin looks terrible in certain strong lights. I agree that a 1 mm size is not long enough for serious scars and 2 mm size is not suitable for beginners and probably not necessary. 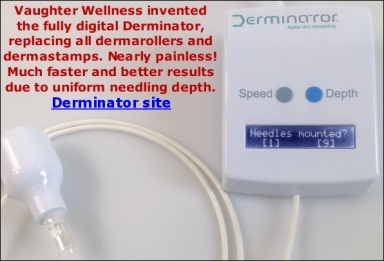 Buy a regular 1.5 mm dermaroller and a 1.5 mm dermastamp with 35 needles. You can roll and stamp during the same session. First stamp the scars, and then roll the entire area. If you have many scars, do not treat your entire face in one go. Do one cheek (thoroughly) when it heals do the other etc. If you have the rolling type of acne scars, trying the suction pump is a good idea. You do not have to use topicals. Tretinoin cream is however indicated (apart from other things) for acne so it should not break you out. Initially, it can sometimes make acne worse before it gets better. "Sarah, in response to your post above..... last week I received my order with your 0.025% Ret LOTION in a little jar, and it is working WONDERS on my adult acne after only 1 week. I see it is suddenly no longer on your website, are you replacing it with a CREAM version then? I want to order it right away when it becomes available so I don't run out, I have never had such an immediate result in improving my acne! I am waiting for my acne to clear before I use a dermaroller for the first time. Thank you!" Keep the skin moisturized after your sessions. Use a cream that you know does not break you out. If you can document your experience, that would be great. Dermarolling / Microneedling / Re: "Inhibitory effects of vitamin E on collagen synthesis and wound repair" ? ..but this whole subject is very complex and there should be no simplistic conclusions drawn from it. So far, none of our customers who do use vit. E after dermarolling reported any problems. Currently, I do not have time to research the subject int-depth but when I have time, I will look into it. Thank you, geijutsu12, for describing your experience. Happy to hear dermaneedling worked for you. Dermarolling / Microneedling / Re: new to dermaroller what should I buy to start off with? Select specific suggested tools for your specific wrinkles. Tretinoin makes skin initially dry and red but this should eventually go away. You can mix Tretinoin with any other creams or oils to offset the dryness. I use almond oil (sprinkle cotton pad with tap water, add oil and apply it on your skin). If you can document your progress that would be great.